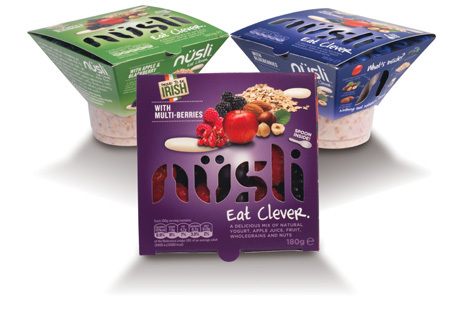 Three great flavours to help you eat clever on the go. It’s everything you want, mixed in one pot – and it’s 100% Irish! Feel good about yourself from the inside out. It’s all about the finest, freshest, most wholesome ingredients. Nüsli. Nothing but nature’s finest. Eat clever, eat Nüsli! It’s everything you want, already mixed in one pot – a super-fast fix of slow-release yumminess that fuels you up, keeps you going and tastes incredible too. A delicious mix of natural yogurt, apple juice, fruit, whole grains and nuts, Nüsli is made from the purest, freshest, highest quality ingredients. And for busy bodies, it’s packed with goodness that’s nutty, fruity, creamy, tangy and crunchy. And always utterly moreish!